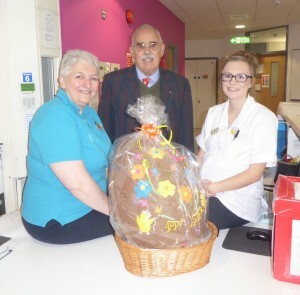 The Rotary Club of Newport in the run up to Easter held its annual ‘Giant Easter Egg’ raffle ticket sale at the Waitrose store in Newport. Pictured at the Waitrose Newport store are Gavin Millman and President Edward Ward prior to drawing the winning raffle tickets. The Giant Easter Egg together with a number of other smaller prizes were delivered to prize winners in time to be enjoyed on Easter Sunday. The winner of the Giant Easter Egg was local resident Dave Gittus who kindly donated the Giant Easter Egg to the Children’s Ward at PRH on Easter Sunday. Pictured are Dave Gittus, Lisa Harries and April Davis together with the Egg. CD by Rotarians to commemorate the 100th anniversary of the end of WW1.